(CRISFIELD, MD – March 8, 2017) The Crisfield Heritage Foundation’s Board of Trustees recently recognized new and retiring board members at its annual meeting, held at the waterfront J. Millard Tawes Historical Museum in Crisfield, Md. Also recognized were Mary Ann Peterman as 2016 Volunteer of the Year, Eddie Heath Crab Pot & Supply with the Heritage Award, and U.S. Coast Guard Station in Crisfield with the Chairman’s Award. Retiring from the CHF Board are Beth Clough, Shawna Kearsley, Tom Shores, and Cindy Stevens. Each received a plaque recognizing their service and commitment to the non-profit foundation. Joining the Board are Barbara Kuebler—who is returning to the Board—along with Cathleen Bradshaw-Parks, Martin Schlegel, and Eddie Somers. Crisfield native Beth Clough has served on CHF’s Board for eight years, serving a term as Secretary. For Clough, the inception of Dock Day as well as the purchase of the Custom House are noted accomplishments of CHF, as well as the continual success of the Road Scholar and camp and tour programs for the children. She hopes CHF will attract more of the public to the museum and gift shop in the future, along with the completion of the Custom House renovation project. Clough has worked with PNC Bank AVP Business Banking for more than 32 years, currently serving as Vice President Business Banking. She is on the Board of Amanda’s Mission for God and includes the United Way of the Lower Eastern Shore, Crisfield Area Chamber of Commerce, Crisfield High School Band Boosters, along with numerous church boards in her volunteer service. Relocating to her hometown of Crisfield 10 years ago, Ward Museum of Wildfowl Art’s Client Services Coordinator Shawna Kearsley joined the Board in 2014, and feels the Road Scholar programming hosted at the J. Millard Tawes Historical Museum each spring and fall are highlights to the Foundation’s achievements. Her hopes for CHF moving forward include expanding program offerings to meet the interest of diverse audiences, including K-12 and adult education programs. Kearsley’s volunteer service includes working with Somerset County Arts Council and Crisfield Economic Development committee. Serving on the Board since 2008, Tom Shores feels CHF’s most significant accomplishment during his tenure is the preservation of many of Crisfield’s most treasured places—including the Ward Workshop—along with the history of the seafood industry through the shanty at the J. Millard Tawes Historical Museum. The now-retired Crisfield native served 39 years to the local community through his work as a banker, starting at the Bank of Crisfield and continuing through at PNC Bank. Shores currently serves as Treasurer of the Crisfield Area Chamber of Commerce and the Music Director and Organist at Crisfield’s Asbury United Methodist Church. His volunteer work includes serving on various committees and boards throughout the years. Wilson Realty owner Cindy Stevens is a previous Secretary and Past-Chairman of the Board, having served in the position for four terms over 11 years and with deep ties to the organization’s beginnings. The Marion, Md. native’s father, Robert Wilson, was a founding member of CHF and the J. Millard Tawes Historical Museum. She is a Past President and Treasurer of the local Junior Auxiliary Board, and served on the Board and as Finance Committee Chair for the McCready Foundation. Stevens’ currently serves as Treasurer of Crisfield High School’s Band Boosters, and is active in the Athletic Boosters. Her volunteer work has served the Crisfield Area Chamber of Commerce, Crisfield’s Asbury United Methodist Church, Junior Achievement at Woodson Elementary School, and Christmas in Crisfield. During her time on the Board, Stevens recalls a fundraising gala on the Manokin River that raised funds for the Cedar Marsh project and was widely supported by people in the community as a significant accomplishment, and hopes the Foundation will continue to focus on its mission looking forward. Barbara Kuebler previously served on CHF’s Board from 2000 to 2005. Born and raised in Crisfield, Kuebler lived in northern Virginia for 31 years before moving back to her hometown in 1998, after selling her patent and trademark research firm, Landon, IP. Now back on the Board, Kuebler says she hopes to see the economic success of the CHF and its commitment to keep our rich heritage alive during her tenure. Kuebler is a longstanding volunteer in the community, with her service contributing to the Crisfield Elks Lodge, Ladies of the Elks, Crisfield American Legion Auxiliary, Crisfield Community Beach Committee, Salvation Army, the Vietnam Veterans Memorial in Washington, D.C., and The Moving Wall’s appearance in Salisbury, Md. Her American Legion committee work includes Freedom Fest, Veterans Day breakfasts, special dinners, and numerous other functions and events benefiting the people of Crisfield, Md. New CHF Board member Martin Schlegel grew up outside of Reading, Pa. before moving to Salisbury, Md. 28 years ago. Schlegel often stays in Crisfield aboard his boat The Lucky Dog at Somers Cove Marina, and hopes to help CHF create an environment and atmosphere that builds awareness of Crisfield’s rich heritage and history. Schlegel is the owner of Strategic Commerce Solutions, a merchant service company for Ignite Payments, having served on Easterseals’ corporate board for one term, and on its advisory board for more than 12 years. His volunteer work includes serving the United Way, Oak Ridge Baptist Church, and Leukemia & Lymphoma Society’s Team in Training. Also joining the Board is Eddie Somers, originally from Smith Island, and now of Crisfield, Md. Captain of the Maryland buoy tender and icebreaker J. Millard Tawes for 28 years, Somers is the current volunteer President of Smith Island United. In serving CHF, he hopes the organization continues to invest in the Road Scholar program and showcases the true character, knowledge, and integrity of Chesapeake Bay watermen to Crisfield’s locals and guests alike. New CHF Board member Cathleen Bradshaw-Parks was born and raised on Tangier Island, and moved to Crisfield in 2004. Now a Special Education teacher at Greenwood Elementary School, Bradshaw-Parks began her 16-year teaching career in Virginia, and has served the last 13 years teaching in Somerset County Public Schools. 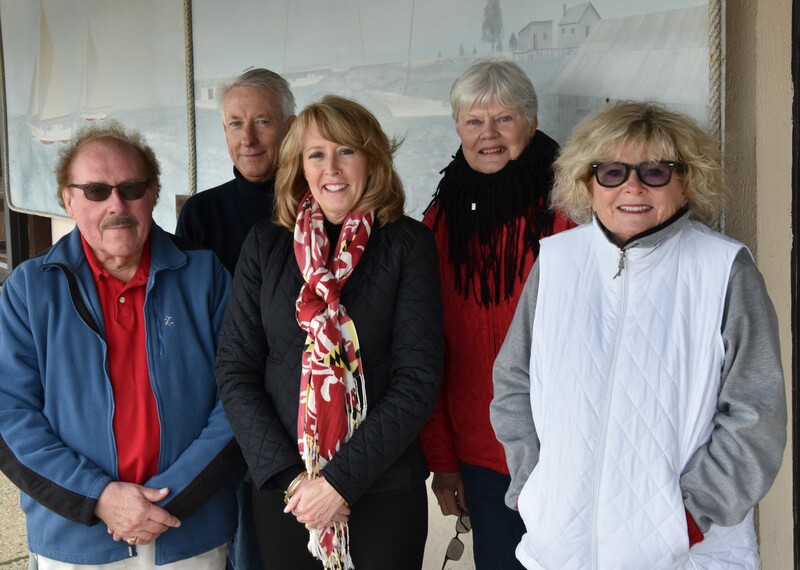 During her time on the Board, she hopes CHF will help promote tourism and economic growth in Crisfield and its surrounding areas, while preserving and sharing the region’s rich history. Bradshaw-Parks has served 4 years as American Cancer Society’s Relay for Life Virginia Eastern Shore Chapter Chairman, and is a past member of the McCready Memorial Hospital Junior Auxiliary Board. Her volunteer work has served Riverside Hospice and numerous charities benefiting women and children through Gamma Phi Beta sorority. The Crisfield Heritage Foundation’s mission is to preserve the heritage of Crisfield and its environs; to educate the public concerning this heritage; and to serve as the central hub around which tourism in the Crisfield area revolves. CHF’s entities include the J. Millard Tawes Historical Museum & Gift Shop, Ward Workshop, J. Millard Tawes Library, Cedar Island Marsh Sanctuary, and the Crisfield Customs House. The second floor, waterfront Chesapeake Room at CHF’s Tawes Museum is now available for private rentals, with more information at 410-968-2501, or by visiting the non-profit’s recently updated website at crisfieldheritage.org. The Crisfield Heritage Foundation recently recognized several Board members at its annual meeting, held at the waterfront J. Millard Tawes Historical Museum’s Chesapeake Room in Crisfield, Md. Pictured from left: Tom Shores, Jay Tawes, Beth Clough, Mary Ann Peterman, and Barbara Kuebler. Mary Ann Peterman was recognized as 2016 Volunteer of the Year, along with Eddie Heath Crab Pot & Supply with the Heritage Award, and Crisfield’s U.S. Coast Guard Station with the Chairman’s Award. Retiring from the CHF Board are Beth Clough, Shawna Kearsley, Tom Shores, and Cindy Stevens. Joining the Board are Barbara Kuebler—who is returning to the Board—along with Cathleen Bradshaw-Parks, Martin Schlegel, and Eddie Somers. We have multiple museums and attractions operating at differing times throughout the year. Please view our site and contact us to experience all of what Crisfield has to offer.